It’s the first Friday of the month, so it’s time to review all the exciting recent developments in the frugalosphere. May was a month of themes, some old, some new. 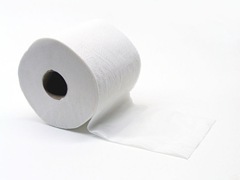 In the old category there was the ongoing frugal controversy over toilet paper. We were cheered to read that a California county stopped buying four-ply tissue. Much of California’s current budgetary troubles are no doubt traceable to this luxury. And the Frugal Duchess shared a related tip: flatten the roll "a bit" so it doesn’t roll so easily and waste paper. But then One Caveman’s Financial Journey had a long and well researched post making the case that, in the long run, more expensive toilet paper is actually cheaper. Apparently, his research shows that a person uses less of the good stuff, resulting in a net savings of $0.002 (a fifth of a penny) per bathroom visit. We will have to wait for other frugal scientists to reproduce these results before we accept his findings. Another foundation of the frugal lifestyle was threatened by One Frugal Girl, who touted a sinister product that replaces both laundry detergent and dryer sheets. The product, Wonder Balls, from the stolidly named Mystic Wonders Incorporated, replaces detergent with a reusable yellow ball that "works through physics. The frequency enhanced mineral blend within the ball creates an energy field when agitated in the machine." And there is a pair of similar balls for the dryer that replaces dryer sheets. Magic this may be, but for the frugalosphere it is clearly black magic. Obviating the need for homemade laundry detergent and dryer sheets is just wrong. Other themes were more seasonal. With summer vacation approaching, it’s time to worry about how to entertain the little ones frugally. Almost Frugal brought us a list of 20 Frugal Kid Toys. Most were inexpensive rather than free, but #4, mud, and #6, a bucket of water, would fit in almost any budget. And in case your kids are the kind that appreciate the fun and adventure of comic books, Frugal Plus provided a link to free comic books available from the Federal Reserve Bank of New York. Titles include "The Story of the Federal Reserve System" and "The Story of Checks and Electronic Payments." The final theme noticed here at Frugal Friday was bacon. Frugal Upstate shared a recipe for pecan and brown sugar covered bacon. And the Coupon Queens of Laurel Run shared news of an entire line of bacon flavored products now available including salt, mayonnaise, and, of course, lip balm. That last one is destined to be a national sensation. As the Queen gushed "I might as well have had two strips of bacon sitting on my lips." Speaking of exciting new products, Clever Dude told us about a frugal way of keeping up with your neighbors. Instead of going to the expense of owning, for example, a ’72 Corvette, now you can get a large photograph of one to put over your garage door. And if more substantial home improvements are on your mind, Wise Bread shared a tip. It seems that you can get cheap and/or free construction materials from nearby failed housing developments that are being demolished. But don’t pick up any used air conditioners. Those use up a lot of expensive electricity. Pecuniarities had a post describing a brilliant and money saving substitute. Take ice from the automatic ice maker in your freezer, place it in a bowl, and run an electric fan over it. When the ice melts, toss out the water and start over. Think of the savings! This is a bad idea unless you live in the desert where the night and day temps have a large swing (like 30-50 degrees) since the heat generated from making the ice is more than the ice will cool in front of a fan. I will admit I use to freeze my clothes when I was really young. I think there may be some truth to this. I know my wife certainly creates a high energy field when agitated. Which occasionally results in the perfect cleaning state. This could be the result of the water in her being energized, since she’s 94% water (I could look up the real number, but previous posts suggest this is not necessary). Who are these strange parseltongue-speaking marketers who make products that allow us to clean clothes without actually cleaning them?! And where will we go for crosses to put on our backs, if we don’t have to make our detergent anymore! Blasphemy! Thanks for the mention about our ice cooling system. We do live in the desert where it gets significantly cooler at night and where the air is dry, so this system works well for us. Another way (the way we do it) is to freeze water in empty plastic bottles/jugs from juice, spaghetti sauce, etc. so you can reuse the water and with caps/lids so the water doesn’t spill and the air doesn’t get as humid as simply leaving it uncovered. And freezing them at night when it’s much cooler makes it less work for the refrigerator. If you like the Wonder Ball then you might also like the Wonder Wire. This amazing piece of technology which has taken Europe by storm allows you to dry your clothing without the use of electricity. By using its patent pending reverse ion charging low resistance alloy the Wonder Wire harnesses the electro magnetic radio inductive optical properties of the air molecules. The Wonder Wire can dry your clothing using little or no electricity. Jim: I think you should point out that the wonder wire may take longer to work if you are cooling your home with ice cubes. The ice thing doesn’t work! At least, not in the scale of the entire house. Running the refrigerator generates heat. If you’ve ever tried to cool your house by leaving your refrigerator doors open, you’ve failed, because more heat is generated than the refrigerator can take away. Same goes for the ice. When the fridge is out of ice, it makes more. To make the ice, you use extra energy, and thus produce more heat. The drop in temp you gain from the ice will be less than the amount of temperature the fridge adds to the room. If you’re cooling a separate room, or only want spot cooling, i guess the ice thing would make sense, but if you’re trying to cool the room the fridge is in, forget it..
Kinda funny, the original post is called “Frugal Thermodynamics”, but they don’t know anything about it!